12-Jun-2012 -- We started our trip to Zavhan aimag for 3 weeks in June 5, 2012. There were three families: Bazraa, Adiya, Gantumur started our trip from Ulaanbaatar city in the early morning. 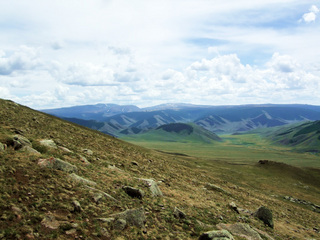 Our ultimate purpose of the trip was to reach Otgontenger holy mountain and the confluence spot of N48 / E97. We were born in Zawkhan aimag but we are living and working in UB now. After 3 days we arrived at the Otgontenger Holy Mountain. The mountain is 3750m high. Many people arrived from everywhere to celebrate that mountain. There was president of Mongolia, monks, 999 horse-head musicians and many people. We saw horse rides and wrestling. We stayed 2 days there. Then we drove to center of Zawkhan. On the way back from Zawkhan we visited confluence spot of N48/ E97. To within 1 km with our cars and rest of the way on foot then about 300m up the mountain (Khatavch), at last we arrived at confluence spot of N48/ E97. We took pictures with GPS.